The leading mobile broadband manufacturer has finally released its Quadcore-powered Long-lasting Dual SIM fun, it is also cheap! Huawei Mobile just announced that Huawei Ascend G525 will be priced at Php6,990. So, what can we expect from Huawei mobile this time? Cheap price always comes with downside specs and features, like the RAM for instance, running on a Quadcore requires a lot of RAM. Huawei Ascend G525 has only 1GB RAM, although it won't really affect the mobile experience a Quadcore smartphone, it should have at least 2GB RAM for optimal performance. Another thing that I have been keeping questioning myself is the battery, I know the title says it all, but a 1700mAh? On a Quadcore? I don't think it will last long, well that is just my opinion and lets wait for reviews for proper judgement on Huawei Ascend G525, more specification below. Huawei Ascend G525 is priced at Php6,990 SRP and available now in the Philippines nationwide. Dual SIM/Dual Standby- Most international brand smartphone doesn't really put this kind of feature, but Huawei mobile did. Usually this is only found in our local smartphone brands. Quadcore 1.2Ghz- Why? See the price and you'll know, and Huawei mobile is no ordinary brand, a Quadcore for a less than 10k smartphone is a true feature to add. 720p Video recording- Watching movies on a 1080p in mobile doesn't give that much difference than 720p. 3MP Front Camera- A powerful camera indeed, suitable for clear video calling with Skype, Facebook, etc. Have something to share? 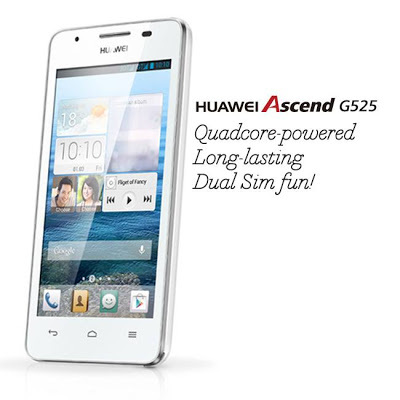 Kindly share your experience with Huawei Ascend G525! any idea where to find memoxpress sa bacolod? Hindi ako taga bacolod sir.